The Dragon is in the Field! You sickos who have already been stupid enough to get a tattoo want everyone else to suffer too, so you say, "Oh, no, didn't hurt a bit! ", "Tickled so much he kept yelling at me to quit laughing and sit still!" Sorta resembled being chopped up with a scalpel plugged into a wall socket! When my vision started graying out and I broke out in a sweat 20 minutes into it, I suggested we take a break. Okay after that. Damned if I'm gonna chicken out and get stuck with a half done tattoo! Amazing. I was resigned to my fate, but body says, not acceptable - gonna check out if this stuff don't stop!. I think that individuals have different pain tolerance levels, so a person like me(accupuncture even makes me squeal, but i keep going back) who has a low pain threshold is being more brave to stick thru it than someone who "doesn't feel a thing". That's my story and I'm sticking to it! Afterwards, I told Dino his work was excellent, but it will be a while before I forget how much it hurt and come back for the second one. He just smiled knowingly. In hindsight, maybe it would have been a good idea to start with something less than five inches and two hours of full color, but what the hell! You guys who haven't had one, yet, I'm just kidding. They really don't hurt a bit. Trust me! Location: left shoulder blade. 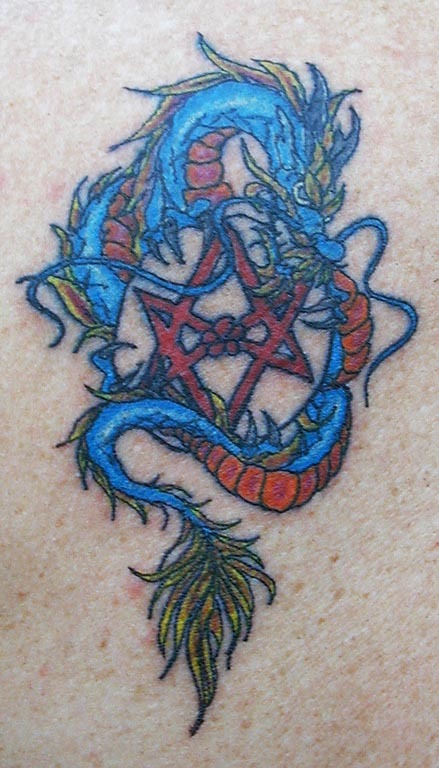 The center design is called the unicursal hexagram. The Unicursal Hexagram was made known by Aleister Crowley. It symbolizes the void we came from and the void we shall return to. It is Humility. It is also found on the Qabalah between points one thru six.